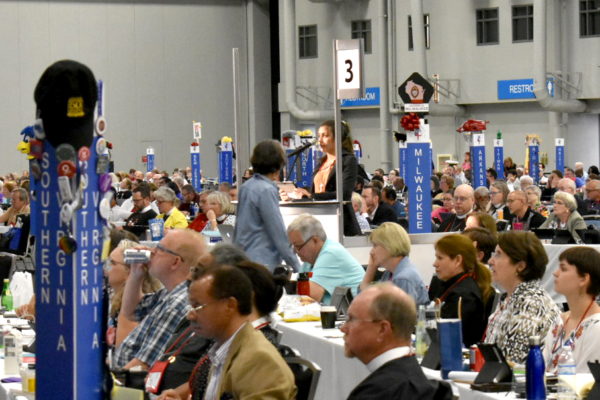 [Episcopal News Service – Austin, Texas] If there was one issue that defied any expectation of controversy at the 79th General Convention, it was immigration. Bishops and delegates arrived in Austin last week on the heels of a national uproar over the Trump administration’s “zero tolerance” policy toward immigration, particularly the decision to separate children from parents in detention. And despite the administration’s reversal on family separations, immigration policies continued to be a hot-button issue, including in the border state hosting the Episcopal Church’s triennial gathering. But if the country remains divided over what to do about immigration, the thousands of Episcopalians gathered here presented a unified front in support of families who have been separated, of those facing deportation and of immigrants in general – through prayer, testimony, action and the unobstructed passage of legislation. 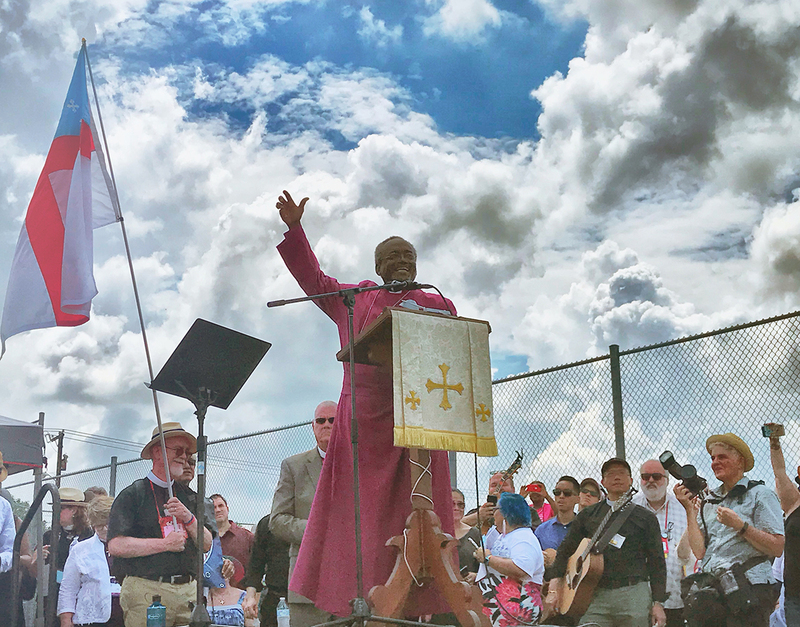 One of the defining moments of this General Convention was the prayer vigil held July 8 outside the Hutto Detention Center, an immigrant detention facility a little more than a half hour outside of Austin. A massive gathering of more than a thousand Episcopalians prayed and sang in support of immigrant parents and children who had been separated. That spirit carried through to the church’s legislative process. About 25 people testified July 7 at a hearing on all resolutions related to immigration, and the Trump administration’s policies loomed large. The Rev. Nancy Frausto, who was a featured speaker at the TEConversations joint session on racial reconciliation, testified at the hearing to her fear of deportation after President Donald Trump ended a policy of protection for “dreamers” like her who were brought to the United States illegally when they were children. “The 800,000 Dreamers need to have the Episcopal Church stand behind them, and not just them but all immigrants,” Frausto said, speaking in favor of Resolution C033, which puts the church on record as respecting the dignity of immigrants and outlines how public policy should reflect that belief. The latter resolution encourages Episcopalians and congregations to reach out to and support immigrants facing deportation, including by providing physical sanctuary if they choose, but “this resolution does not call on them to do so,” committee member Daniel Valdez of the Diocese of Los Angeles said on the House of Deputies floor during debate on the resolution July 12. “Sanctuary has a powerful theological grounding,” Valdez said while emphasizing the resolution’s intent, to encourage Episcopalians to make connections with undocumented immigrants, such as through legal assistance, advocacy or pastoral care. The House of Bishops had passed the three resolutions without objection and without discussion in voice votes July 11, and the three were taken up together in the afternoon session July 12 in the House of Deputies. Diana Marcela Abuchar Sierra, a member of the Official Youth Presence from the Diocese of Colombia, spoke out against the Trump administration’s immigrant detention policies during floor discussion of A178. Wendy Cañas, a deputy from the Diocese of New York, offered a similar sentiment in supporting C033. As in the House of Bishops, no one spoke against any of the three resolutions in the House of Deputies, and the deputies were essentially unanimous in favor. All three voice votes passed without any audible “no” in the hall.